We created informal drop-in ‘Vaccine Conversation’ events for local women. 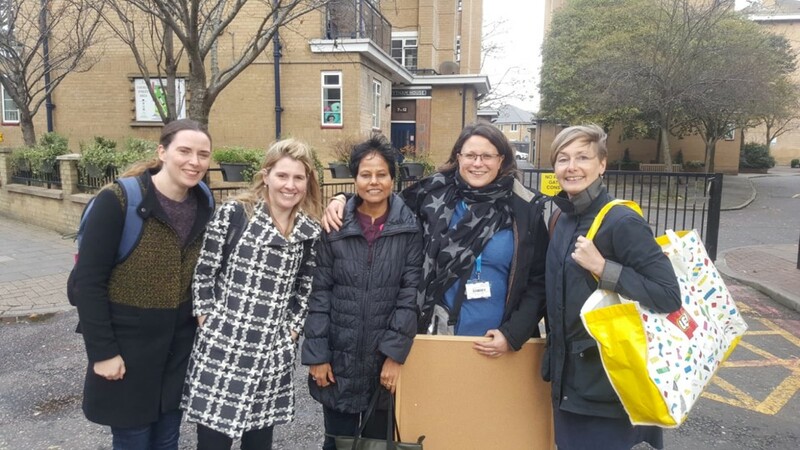 We partnered with the local Mosaic Community Trust for community based events after meeting their Director, Lena Choudary-Salter, at the EIT Health Co-CReating Innovation Solutions for Health (CRISH) course in London in April 2018. 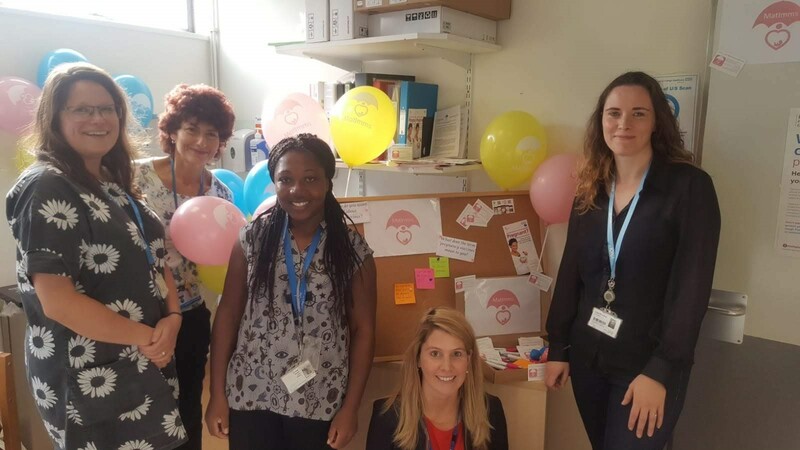 At the community events, run with Lena and her community outreach workers, free baby massage workshops and lunch were provided alongside opportunities to discuss pregnancy vaccines with the MatImms team. We chose to partner with the Mosaic Trust as they are a well-established community group working locally in a socially deprived area in North West London. Low maternal vaccination uptake is associated with deprivation, so we wanted our public involvement work to involve women who may not have previously engaged with research. We also ran a drop-in vaccine conversation event at St. Mary’s hospital antenatal clinic to engage with pregnant women attending appointments on the day. We wanted to engage local women in maternal vaccine research to improve local maternal vaccine information and services. 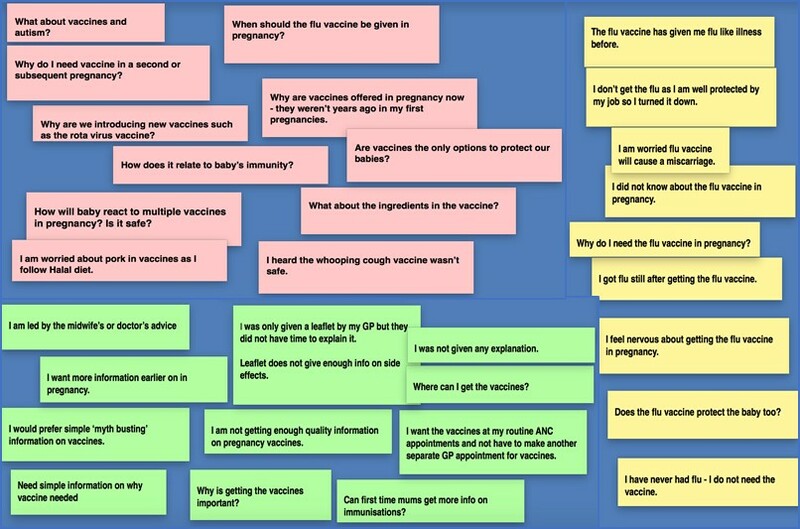 Our events aimed to provide an opportunity for women to ask the questions important to them about vaccines given in pregnancy to inform our research. We hoped to provide useful, clear information on pregnancy vaccines so those attending could improve understanding among their own local networks and counter vaccine myths. Additionally, we wanted to provide an opportunity for women to evaluate the MatImms app that our team designed. By reflecting on the app features with the end-users, we also hoped to get additional feedback for future modifications to the app. We hope that by engaging women in our work our app will be more widely disseminated and ideally used among groups with lower vaccine uptake rates. We also really wanted the events to be informal and fun – part of our pre-planning meetings with the Mosaic Trust featured some very involved discussions on what food would be provided as that was seen as crucial to get right! Meeting Lena Choudary-Salter, the Director of the Mosaic Community Trust, at the CRISH course was pivotal as we became partners in running the community events together with the Mosaic Community Trust. Our team discussions at the CRISH course, particularly with our local new mother ‘patient representative’, highlighted that holding our event at the right community venue was vital to engage local women. It was also important to involve women in the community who influence health decisions – one woman at an event said “my mother-in-law is who I listen to when it comes to vaccines.” Lena also involved the local maternity champions and local health visitors which meant that alongside new mothers, grandmothers and community outreach workers, our events really were multi-disciplinary! The events were very well attended by over 20 local women per event thanks to the Mosaic Community Trust’s support in promoting the events around Church Street. 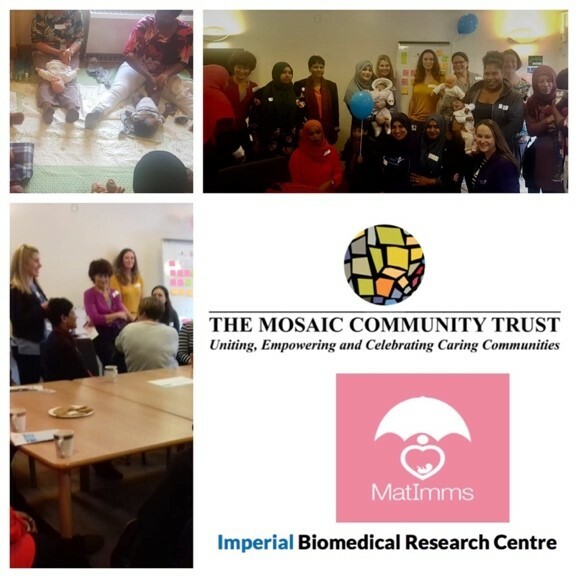 Photos taken at one of the events showing members of MatImms and the Mosaic Community Trust, attendees (including local Westminster Maternity Champions) and the baby massage workshop in progress.Were the people you involved given any training? The Mosaic Community Trust already had several trained local community women who worked as paid project outreach officers locally. These women, such as Fahmida and Habiba, were vital to the success of our project. We funded the local community workers’ time spent on pre-event planning and support for the events. We attended pre-event planning sessions with the core Mosaic Community Trust women to ensure that we were aligned on what the events were aiming to achieve, how they would run and the logistics. At these meetings we also covered the basics of the scientific rationale for maternal immunisation so that the Mosaic’s Community Trust outreach workers were briefed prior to the events. Our public involvement event did considerably increase our understanding of local women’s concerns about maternal vaccines and how women used local maternal vaccine services. Through discussions and our ideas board, women really highlighted what information is important to them and we also got useful feedback on the MatImms app. However, our greatest achievement was unplanned: the successful working partnership we established with the Mosaic Community Trust following meeting Lena at CRISH. This will hopefully be the start of more partnership working in the future. What impact did the PPI have on the people? I think all of us who took part feel enthused about public involvement though, most importantly, the feedback provided by the women attending was overwhelmingly positive. Comments on completed feedback forms included “really enjoyed myself” and “I understand more about pregnancy vaccines.” Positive connections were made at the events such as by Alison (one of the vaccine midwives): “Apart from the amazing #vaccineconversations, my best moment was recognising and being recognised 16 years after watching this great lady become a mum.”, as she had previously delivered the baby of one the Mosaic Trust facilitators. Professor Kampmann said: “It’s so refreshing to connect with the community to whom these interventions are actually delivered and hear their questions and be able to answer some of them. I sometimes feel less connected to the groundwork these days and the PPI event made me feel very happy that I had not lost any enthusiasm – on the contrary, I found it really empowering and it showed me how important this part of our research is and where the next steps should be.” The connections made will enable us all to undertake local public involvement activities in our future work. The antenatal clinic event: L-R: Alison Meinel (Immunisation Midwife, Imperial College Healthcare NHS Trust), Sara Barnett, (Research Midwife, Imperial College London), Evelyn Narh (Immunisation Midwife, Imperial College Healthcare NHS Trust), Dr Helen Skirrow (Public Health Doctor, Imperial College London) and Dr Beth Holder (Lecturer, Imperial College London). As we decided to partner with The Mosaic Community Trust after being awarded the grant, the organisation of our events differed slightly to what we had originally planned. However, this partnership was overwhelmingly positive and led to successful events being delivered. Partnering with an organisation with existing community outreach workers meant that administration of the grant was potentially more complicated particularly as the Mosaic team organised logistics such as venue and catering. However, these administrative hurdles are worth it to achieve impactful partnership working and well-attended events. Be adaptive and flexible when working with local community groups – we ate some great local food catered by local women (an option that I had not even considered for catering) but was assured would be delicious and well received – and it was! Keep events as informal as possible – in the end some of the most insightful conversations the researchers had were over lunch once we had all spent some time together. Lena’s very helpful comment after one pre-planning meeting was “relax and remember it is a community event.” It really was more important to make events informal and relaxed so everyone felt confident to speak up, than making sure we had enough clipboards! The maternal immunisation field is developing rapidly and must include public involvement as more maternal vaccines are developed. Professor Kampmann is the founder and director of IMPRINT, a growing international maternal immunisation network. A core challenge of the IMPRINT network is vaccine acceptability and preparedness for maternal vaccination and involving patients in this work is important. We are disseminating our experiences from this project locally at Imperial College Healthcare NHS Trust and with local and regional stakeholders as well as submitting abstracts to present at conferences with potentially some being co-delivered with the Mosaic Trust. In the short term, we hope to build on this public involvement work with the local Maternity Champions and Mosaic Trust and develop our MatImms app further following the feedback we received. Funded by the National Institute for Health Research (NIHR) Biomedical Research Centre based at Imperial College Healthcare NHS Trust and Imperial College London. The views expressed are those of the author and not necessarily those of the NHS, the NIHR, or the Department of Health.